In this Photoshop Effects tutorial, we're going to learn how to blend photos together like a Hollywood movie poster. Blending photos is easy to do in Photoshop thanks to layer masks, yet finding two photos with similar colors isn't always so easy, and you end up with a photo effect that doesn't really seem to look right because the colors don't match. With this technique, you don't need to worry about the colors in the images at all because we'll be removing them completely and adding our own colors to blend the two photos seamlessly. Any recent version of Photoshop will do, but Photoshop CC and CS6 users in particular will want to check out the updated version of this tutorial. 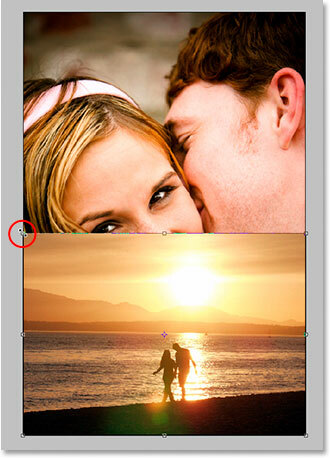 Click inside the first and drag it into the document window of the second photo. The two photos now appearing in the same document. 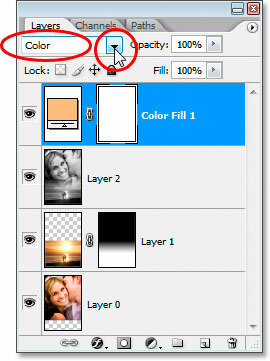 Photoshop's Layers palette showing each image on its own separate layer. 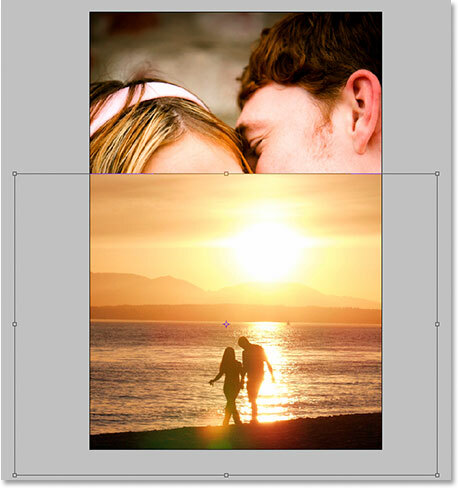 Now that I've dragged the beach photo into the other document, I need to resize it, and I can do that easily with Photoshop's Free Transform command. With the beach photo layer selected in the Layers palette, I'm going to use the keyboard shortcut Ctrl+T (Win) / Command+T (Mac) to bring up the Free Transform box and handles around the image. Problem is, this image is in "landscape" mode, meaning its width is longer than its height, and I've dragged it into a document containing an image that's in "portrait" mode (its height is longer than its width), so even though Photoshop has placed the Free Transform box and handles around my image, I can't see any of the corner handles because the sides of the image are extending out beyond the viewable area of the document. Press "Ctrl+0" (Win) / "Command+0" (Mac) to fit everything, including the Free Transform handles, onto the screen. Hold down "Shift" and drag any of the corner handles inward to resize the image and fit more of it into the viewable area. When I'm happy with the new size of my image, I'm going to press Enter (Win) / Return (Mac) to accept the transformation. 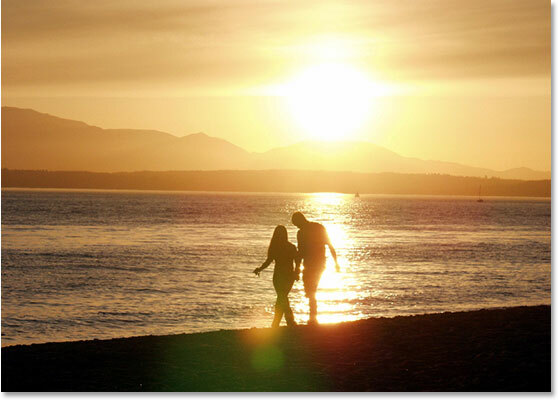 The original image on the Background layer. A warning message telling me that Photoshop can't move the image on the Background layer because the layer is locked. Hold down "Alt" (Win) / "Option" (Mac) and double-click directly on the word "Background" to rename the Background layer "Layer 0". Dragging the bottom image upward using the Move tool. 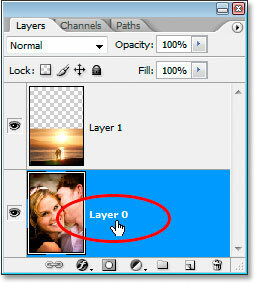 Click on the top layer to select it in the Layers palette, then click on the "Add A Layer Mask" icon. 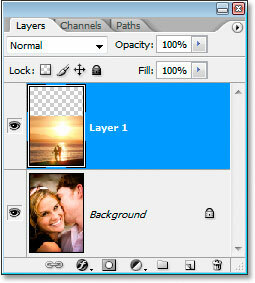 The layer mask thumbnail in the Layers palette. Notice that the layer mask thumbnail has a white highlight border around it. 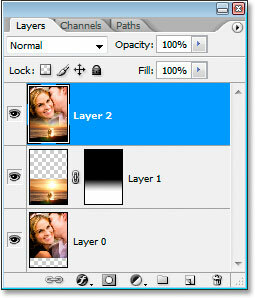 That's telling us that the layer mask, not the layer itself, is currently selected, which is what we want. Select the black to white gradient, third from the left, top row. Dragging the gradient from just below the top of the beach photo to just above the top of the water line to set the transition area between the two photos. The two images now fade from one into the other thanks to the black to white gradient we added to the layer mask. If you're not happy with how your two images have blended together, simply press Ctrl+Z (Win) / Command+Z Mac to undo and try dragging the gradient again. 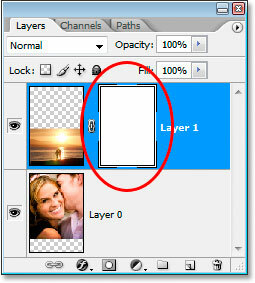 Merge both layers onto a new layer at the top of the Layers palette. 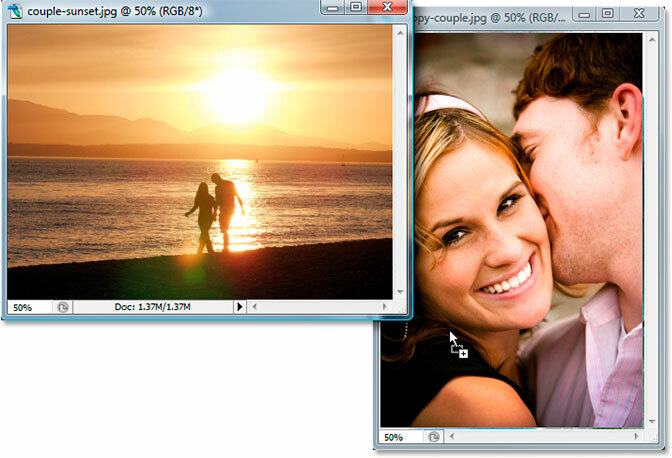 Press "Shift+Ctrl+U" (Win) / "Shift+Command+U" (Mac) to desaturate the image, removing the colors. Add a bit of noise to the image to help blend the two photos together. Click the "New Fill Or Adjustment Layer" icon. Select the Solid Color fill layer from the list. 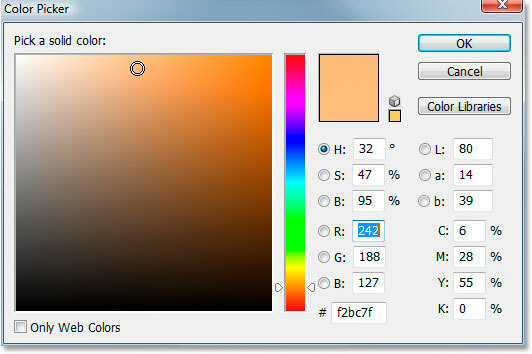 Choose a color to use for your image from the Color Picker. 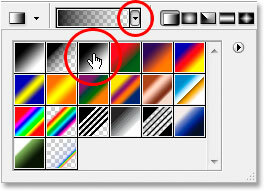 Click OK once you've chosen a color to exit out of the Color Picker. Don't worry about choosing the "right" color at the moment because you can always change it later. Step 9: Set The Layer Blend Mode To "Color"
Change the blend mode of the Solid Color fill layer to "Color". Your image will now be colorized with your chosen color rather than being blocked from view by it. If you decide you're not happy with the color you chose, just double-click on the Solid Color fill layer's color swatch icon in the Layers palette. When you do, the Color Picker will pop back up and you can choose a different color. Since the Solid Color fill layer is already set to the "Color" blend mode, you'll be able to see a live preview of how your current color choice looks with your image. 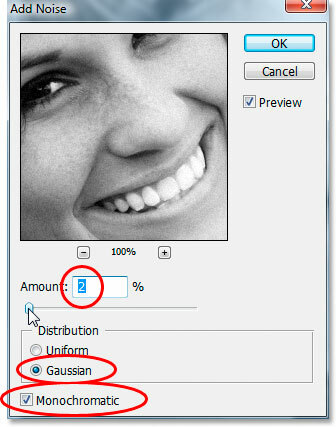 Double-click the color swatch icon in the Layers palette. And there we have it! That's how to blend photos like a Hollywood movie poster with Photoshop! 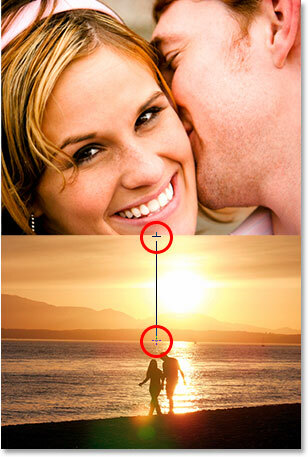 Visit our Photo Effects section for more Photoshop effects tutorials!